​Dawn of a New Era! We have been thinking about ourselves too much and that has given us a strange fatigue that makes us shut off the world around us and cling to our arguments. The moment is ripe, to let our light shine and birth change in the world. 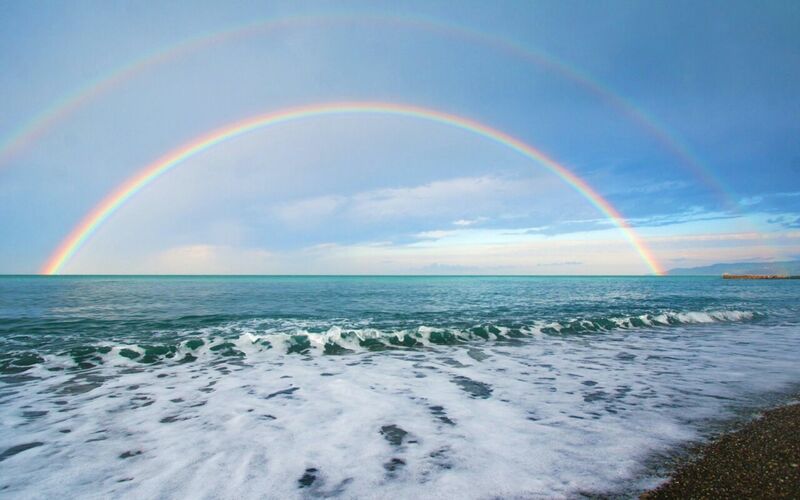 Much can be learnt from the Rainbow, it’s made up of the seven colours of the spectrum of light, cascading of colours from the lowest to the highest frequency. Upon dissolution of the seven colours, it radiates an immense pure white light of the highest vibration. A light and amenable disposition are needed in order to withstand the impact and the strangeness of the knowledge I am about to share. Feeling important makes one heavy, clumsy, and vain. Therefore the path to enlightenment commands that we become light and fluid. We need to reduce our baggage in order to travel light in spirit. All that which is not of benefit needs to discarded during this earthly journey. Our religions and belief systems that have been deeply ingrained in us, only serve the purpose of guiding towards the path leading to the Source but they are not the ultimatum to the Source. The Warrior knows all his brothers and sisters on Planet Earth have the same destination he does – HOME. But each may take a different path. And the Warrior knows that’s okay! All will get Home – no matter what path they take. It cannot be otherwise – for ALL Paths lead Home to the Primal Source. We need to relinquish our fears; we have allowed fear to hold us in captivity for too long. It is about time we let go and fearlessly venture into the unknown. The most effective way to live is as a warrior. In order to become a man of knowledge, one must be a Warrior. A man of knowledge lives by acting, not by thinking about acting, nor by thinking about what he will think when he has finished acting. A man of knowledge chooses a path with heart and follows it, and then he looks and rejoices and laughs; and then he sees and knows. He knows that his life will be over altogether too soon; he knows that he, as well as everybody else, is not going anywhere; he knows, because he ‘sees’, that nothing is more important than anything else. In other words, a man of knowledge has no honour, no dignity, no family, no name, no country, but only life to be lived, and under these circumstances, his only tie to his fellow men is his controlled folly. A man of knowledge is a Warrior with unbending intent. A warrior knows understand the principle: ‘For every action, there is an equal reaction’ while he is waiting patiently. The spiritual insight that the countless paths traversed during his brief earthly transit are all equal. The Oppressors and Oppressed eventually meet at the end, and the only thing that prevails is that life was overall too short for both of them. A man of knowledge is a Warrior ruled by his Will, the Power that lies within. The Warrior knows all Love, all Wisdom, all Power lie within him – within his Mind, his Body, his Heart and his Soul. There is nothing to seek, nothing to find, nowhere to go – except WITHIN. Will is something very clear and powerful which can direct our acts. Will is something a man uses, for instance, to win a battle which he, by all calculations, should lose. It is not what we call courage. Courage is something else. Men of courage are dependable men, noble men perennially surrounded by people who flock around them and admire them; yet very few men of courage have Will. Will is a Power, therefore it requires sobriety in order to be controlled and fine-tuned, and that takes time and patience. The Warrior succeeds because of his Will even when his thoughts inform him that his defeated. Will is a force which is the true link between men and the world. It is the force that comes from within and attaches itself to the world out there. The power that allows the warrior to perceive the world beyond the five senses. As a Rainbow Warrior, the ordinary world is no longer a buffer for him; he has aligned himself with a new way of life, of ‘seeing’ and ‘being’. The knowledge presented to the warrior opens a door of ‘No Return’. Though the knowledge becomes a frightening affair, it sheds light to the warrior that death is the irreplaceable partner that sits next to him on the mat, an ‘ALLY NOT AN ENEMY.’ Every bit of knowledge that becomes power has death as its central force. Death lends the ultimate touch and whatever is touched by death indeed becomes power.The warrior is confronted with imminent annihilation every turn of the way, and unavoidably he becomes keenly aware of his death. Without the awareness of death, he would be only an ordinary man involved in ordinary acts. He would lack the necessary potency, the necessary concentration that transforms one’s ordinary time on earth into a magical powerful experience. A man of knowledge is a Detached Warrior. He always does his best to see the Divinity in all that is. In this way, he harbours no desire to own, control, manipulate, misuse or abuse any of the Great Spirit’s creatures. He upholds the moral code as dictated by the Highest Authority in the Universe. He remains detached from everything for he has acquired a silent lust for life and for all things of life. He knows his death is stalking him and won’t give him time to cling to anything, so he is fearless and lives to fulfil his mission. A detached warrior that only back himself with the power of his decisions. He is the Master of his choices. He fully understands that his choice is his responsibility and once he makes it there is no longer time for regrets or recriminations. His decisions are final, simply because his death does not permit him time to cling to anything. A man of knowledge is a Warrior bestowed with Indomitable Will. There is a power that comes out of the core of his being which is beyond his physical body as he progresses on the path of knowledge. He is the alchemist capable of ‘touching’ anything he wants with a ‘feeling’ that bubbles at the core of his being. A man of knowledge is a Warrior that honours all life forms. He treats everything with respect and honours the great Goddess, Earth Mother. He does not abandon himself to anything, not even to his death. He is not a willing partner and not available, and if he involves himself with something, rest assured with the knowingness that he is fully aware of what he is doing. For a warrior there is nothing out of control, his is an exercise in strategy. He is not embroiled in futile discussions that feed the ego. He never idle and never in a hurry to accomplish anything for he knows all is accomplished within divine timing. A warrior lives strategically and never carries loads he cannot handle. A man of knowledge is a Warrior that lives to fulfil his given mandate. The world is indeed full of frightening things and we are helpless creatures surrounded by forces that are inexplicable and unbending. The average man, in ignorance, believes that those forces can be explained or changed; he doesn’t really know how to do that, but he expects that the actions of mankind will explain them or change them sooner or later. The warrior, on the other hand, does not think of explaining or changing them; instead, he learns to use such forces by redirecting himself and adapting to their direction. The warrior opens himself to these ‘Invisible Forces’ as a means of balancing himself. He wages his battle, knowing that his will is impeccable. He is a Master who selects the items that make his world. He selects deliberately, for every item he chooses is a shield that protects him from the onslaughts of the forces he is striving to use. The average man who is equally surrounded by those inexplicable forces is oblivious to them because his ‘Vision’ is obscured to their presence. The veil of illusion is operational in the average man. A warrior encounters those inexplicable and unbending forces because he is deliberately seeking them, thus he is always prepared for the encounter. And thus a warrior treats the world as an Endless Mystery and what people do as an endless Folly.